Online registration for this event has now closed. If you wish to register for this event please do so at Riverbend Prep Academy (map) on Wednesday, November 22nd between the hours of 1pm and 7pm. Start off your Thanksgiving with an invigorating 5K, 1 mile fun walk/run or kids’ dash in Laveen! This 5K (3.1 mile) run/walk is GREAT because it is a timed (with running chip) event for experienced runners but also developed for those who have NEVER run before or who choose to walk. 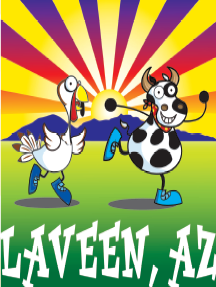 Riverbend Prep Academy has joined with the Laveen Community Council to host the Laveen Turkey Trot & Kids Dash. Their common goal to bring Laveen closer together and support the community to get healthy and active makes this a perfect partnership. Proceeds from this event will be going to the Laveen Community Council and Riverbend Prep Academy. The Turkey Trot will begin and end on the track at Cesar Chavez High School Stadium. The route will wind through Cesar Chavez Park where you can enjoy the beautiful views. The 1 mile run will also begin and end on the track. The FREE Kids Dash will be located on the football field in the middle of the track and while it is free, all parents must register their child beginning at 7:00AM on November 23, 2017. Riverbend Prep Academy is a small (K-8) public, charter school located in Laveen. Riverbend’s mission is not only to develop life-long learners who are prepared to contribute purposefully to society; but also to be a school that contributes to the value and well-being of its community. The Laveen Community Council is dedicated to the community of Laveen and its surrounding areas. They are a 100% volunteer-based organization and all money earned helps to fund youth programs, create a connected community, and build neighborhoods of which we can all be proud. Can't join us for the run and/or want to help even more. Every donation is welcome to support the Riverbend Prep Academy Health/Fitness initiative or programs provided by the Laveen Community Council. Team Captain registers team and members register onto the team. Team registration only available to 5K participants. Team registration is NOT available on November 23, 2017. 1:00PM – 7:00PM Packet pick-up at Riverbend Prep Academy (gymnasium). SWAG bags will be handed out to the first 300 people who pick up their race packet!